Tens of thousands of flamingos line the shores of one of Central Island’s Crater Lakes. 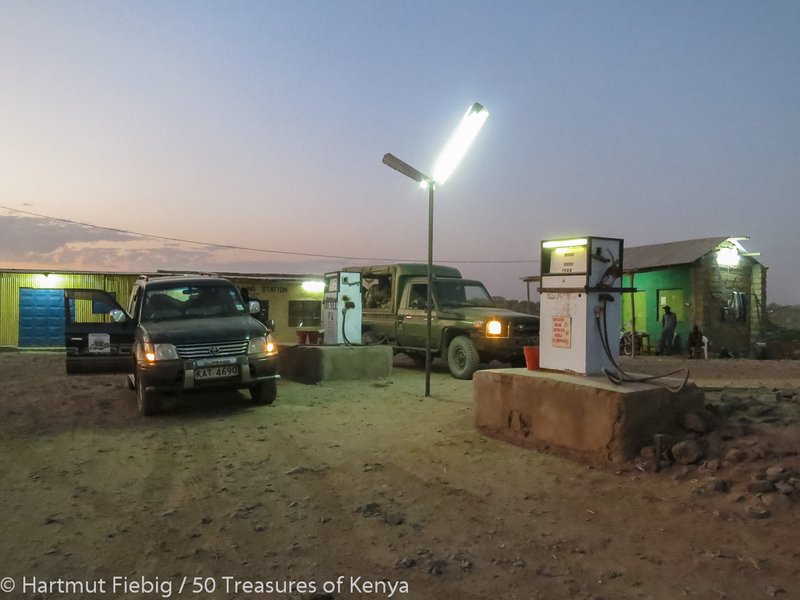 Refilling at a petrol station in Lodwar at dawn to make an early start. 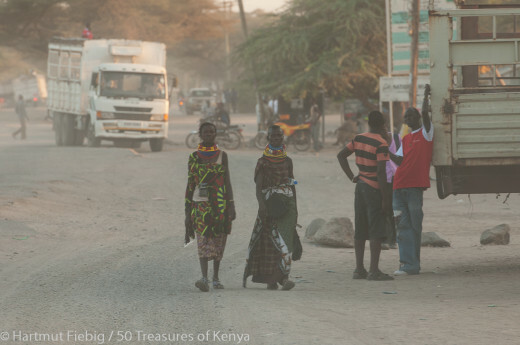 With a population of approximately 60,000 people, Lodwar is the capital and by far the biggest settlement of Turkana County. It stretches on both sides of Turkwell River; a chain of black-redish coned hills is setting the backdrop of town in an otherwise leveled surrounding. 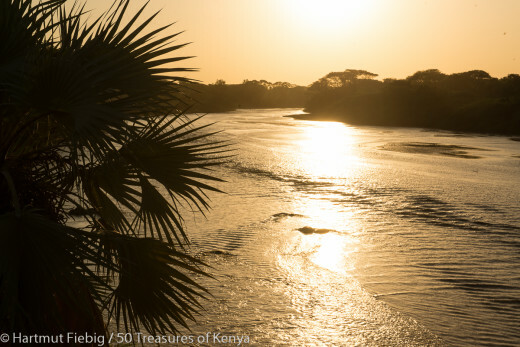 From the narrow, busy Turkwell bridge you enjoy a beautiful sunset view over the palm fringed banks of the river. As sunset is approaching, Turkwell River at Lodwar transforms into a stream of gold. 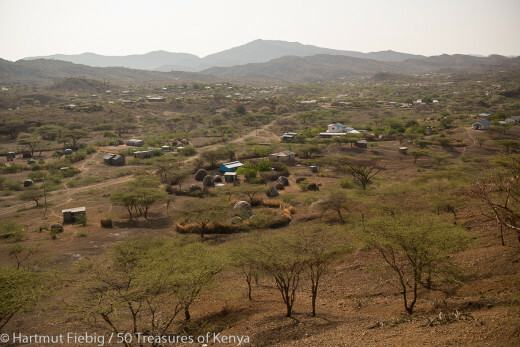 Initially being the administrative town for the British colonialists in northwestern Kenya, Lodwar significantly grew in times of drought during the 1970s and 1980s when many of the affected Turkana pastoralists would seek shelter here. 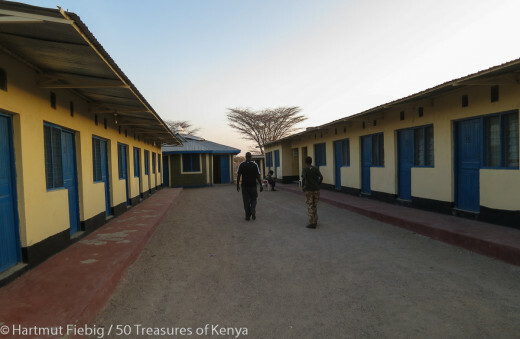 The development of Lodwar got another major boost when it became the logistic centre of humanitarian organisations active the region and in neighbouring South Sudan. In the roads of Lodwar, traditional and modern lifestyles mix. The current president of Kenya, H.E. Hon. Uhuru Kenyatta schooled at the mixed primary when his father was imprisoned in Lokitaung. There is a humble monument site marking Kenyatta’s cell when he was held in custody in town. 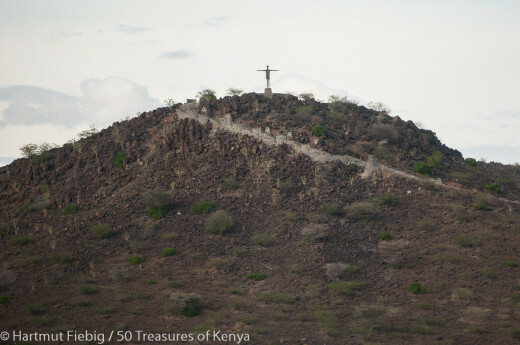 The hill next to the catholic mission of Lodwar bears a Jesus statue which resembles the famous Christo Redentor statue of Rio de Janeiro. You can also stroll over the vivid market and buy local crafts, especially the the exceptionally beautiful Turkana basketries. 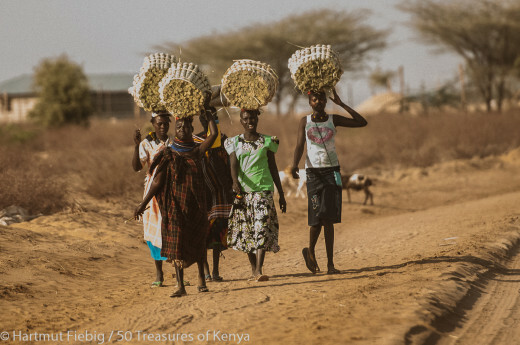 In the early morning you will encounter a long caravan of women bringing their handmade basketries crafted from palm tree leaves to Lodwar town. Lodwar offers markets with fresh produce, well stocked shops, petrol stations, decent to good accommodation and public transport to the south and into the surroundings. The buildings of the County Government lie on a hill at the southern bank of Turkwell river while the airport is found within town. 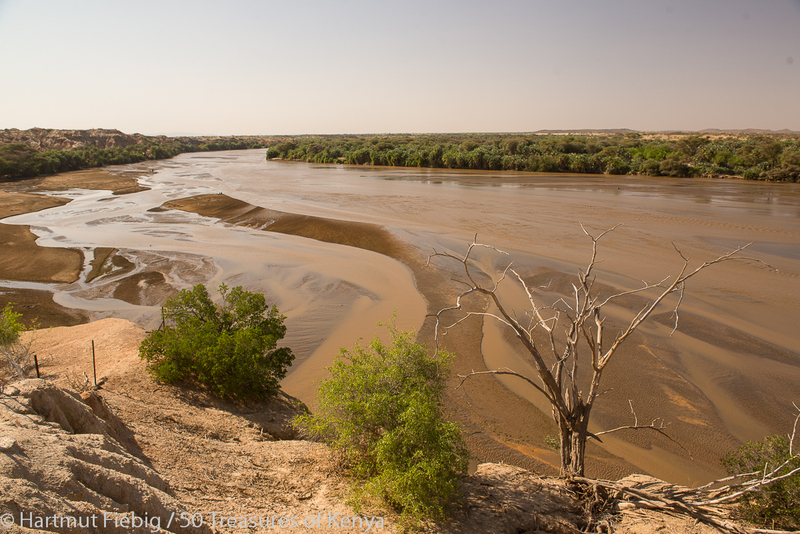 There are several good places to stay in Lodwar as well as decent restaurants and bars. The Sand Fields on the southern banks of River Turkwell is a charming joint for drinks and food which comes to life during the evening hours. You can sit under the stars enjoying a refreshing breeze, your bare feet in the sand. 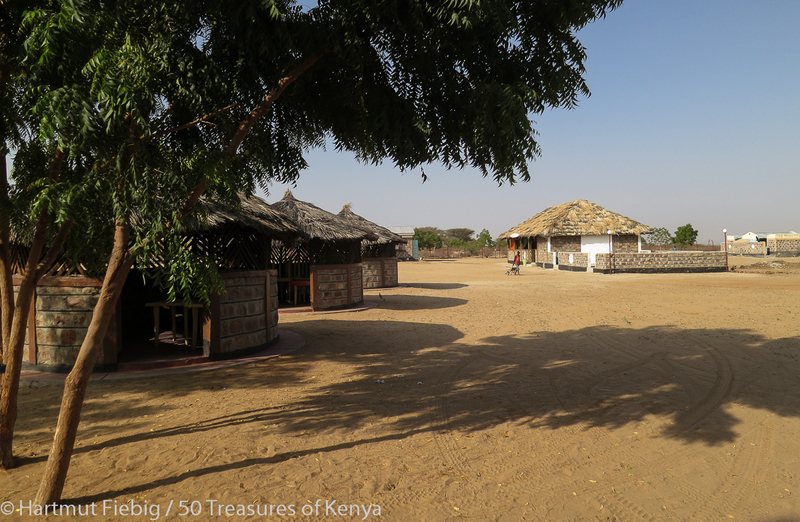 There are camping facilities and a small makuti roofed conference centre, too. 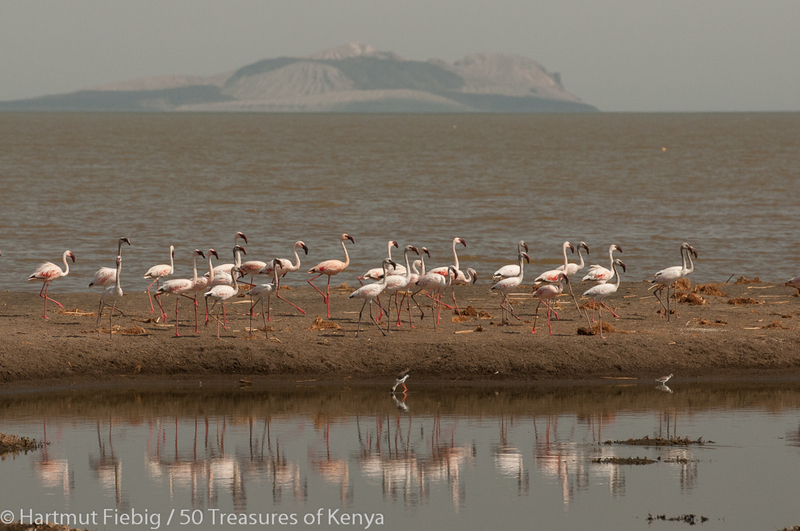 The remaining course of River Turkwell from Lodwar to Lake Turkana offers a beautiful drive on the southern banks. You can follow a car track close to the water and dense doum palm forests or rather decide to cut through the massive plains surrounding Lodwar. 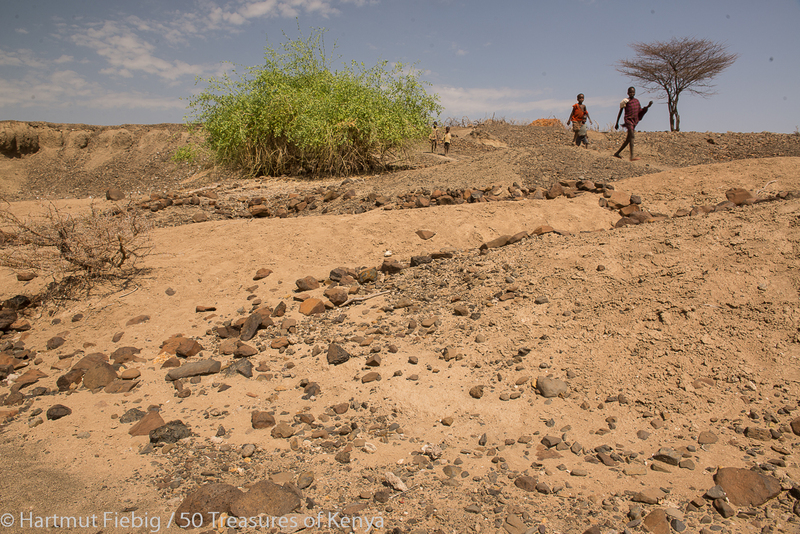 Women and children are fetching water from River Turkwell near Turkana Basin Institute. 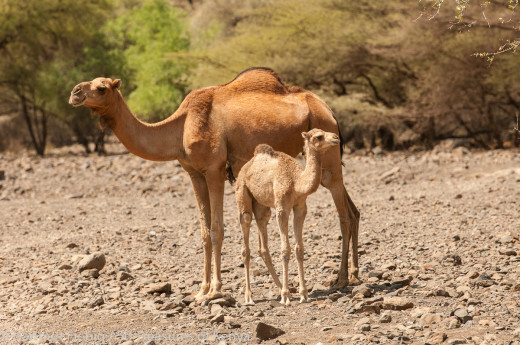 When crossing the plains, you may encounter some antelopes and sure enough you will see large herds of grazing camels and the bee hive shaped huts of their owners that seem to stem from long bygone ages. 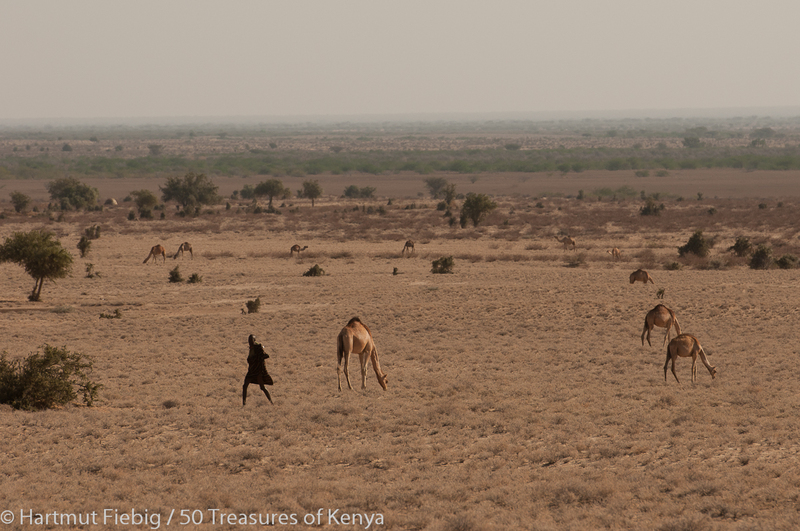 Herding camels in the vast plains surrounding Lodwar. Turkana Basin Institute sits on a cliff above a big river bending in direct vicinity of a fossil site – equally beautiful and practical to serve as a research centre and a field school for domestic and international scientists and students. 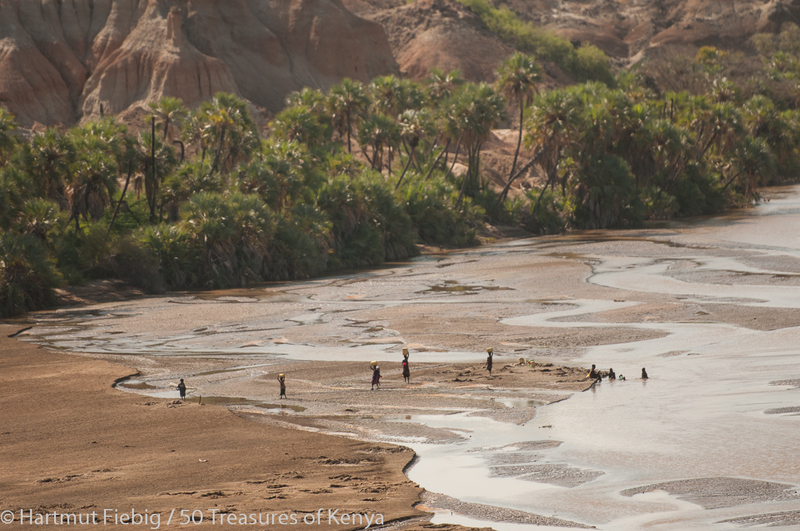 View from Turkana Basin Institute over the landscape of lower River Turkwell. TBI is a brain child of Dr. Richard Leakey, the world famous Kenyan paleoanthropologist. For the time being, TBI is not open for tourist visits. 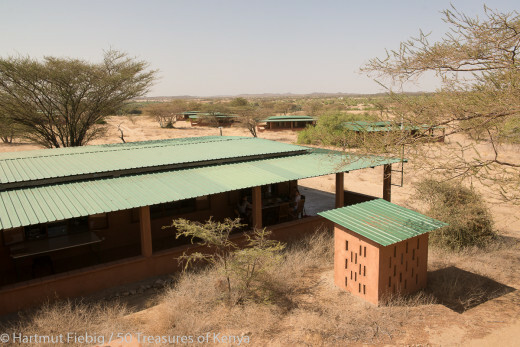 TBI’s campus comprises of student hostels, lecturers’ accommodations, laboratories, classrooms, a library and a cafeteria as well as a workshop and facilities to produce solar energy and clean water in this remote corner of Kenya. 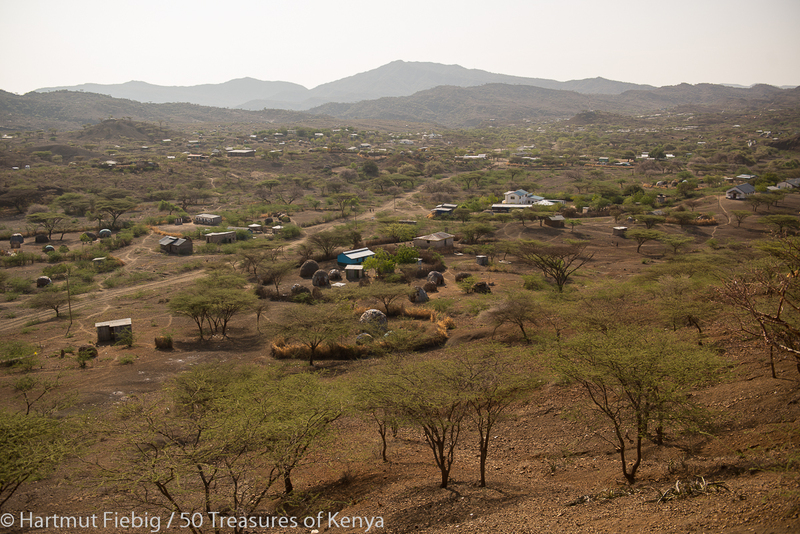 Lokitaung lies in the foothills of Lapurr Range, roughly 200km north of Lodwar. You will drive through a harsh but beautiful land to arrive in the former colonial garrison town which breathes a special feel of remoteness and that seems to be deep asleep. As you enter town coming from Lodwar, you can climb one of the many hills to enjoy an overview of Lokitaung that seems to be deep asleep. 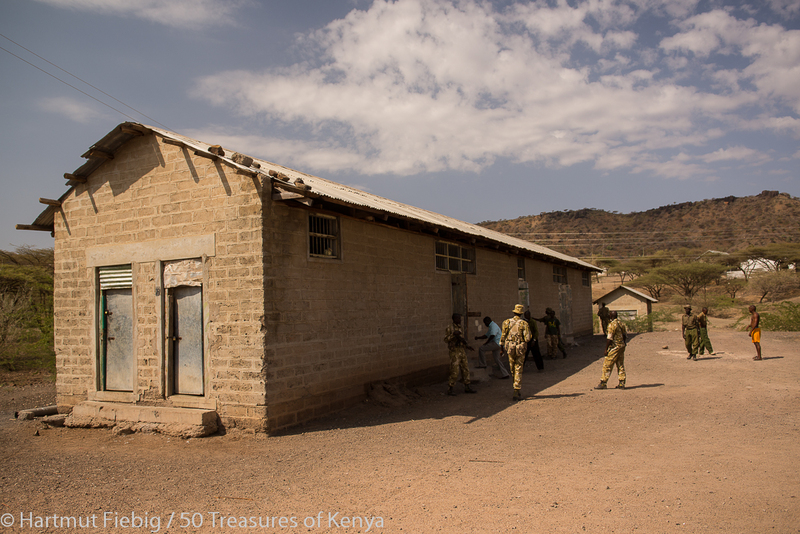 The local prison is of historic fame since Jomo Kenyatta, the founding father of independent Kenya served his seven year sentence of hard labour here along with some of his combatants in the struggle for uhuru, independence. 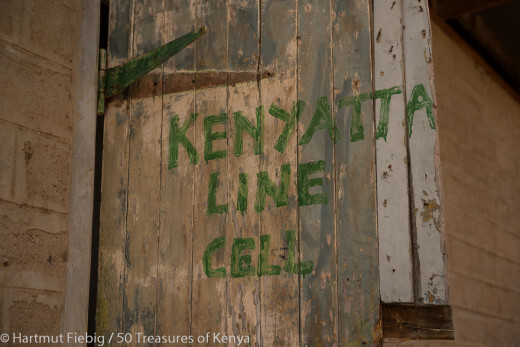 Being a museum site today, the cells where Kenyatta and his companions of the struggle of independence had been locked away have survived half a century. You can visit the historic cells and get an idea of how hard the sentence must felt for the men. The door of Kenyatta’s former cell at Lokitaung prison. In Lokitaung, you will find a simple guesthouse and a good Somali cafe with a shady courtyard to have some food or drink. 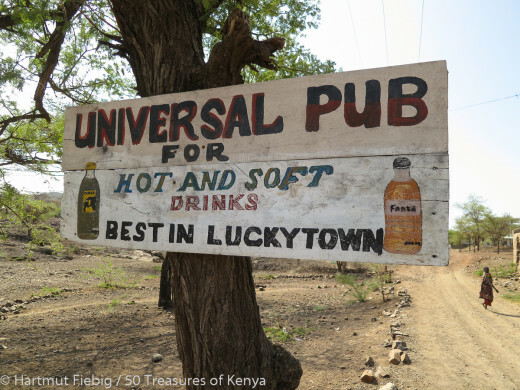 There are several pubs in ‘Lucky Town’ to quench your thirst after driving through the heat blistering surroundings. 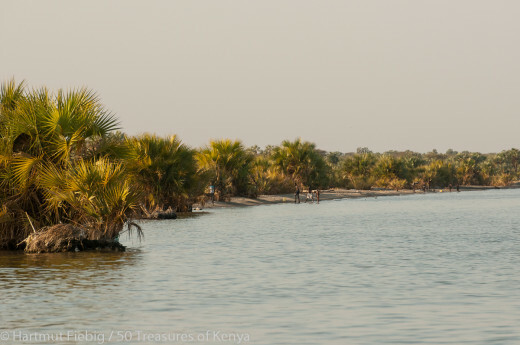 To reach the shores of Lake Turkana, you have to follow the seasonal river passing Lokitaung downstream. The drive through the gorge locally known as Mlangoni, the Gate, is only possible during dry weather conditions. 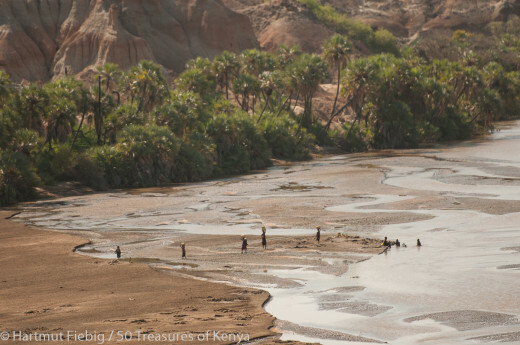 Uncounted bends, overhanging rock faces, age old trees and Turkana families with their animals line the picturesque journey in the dry river bed. 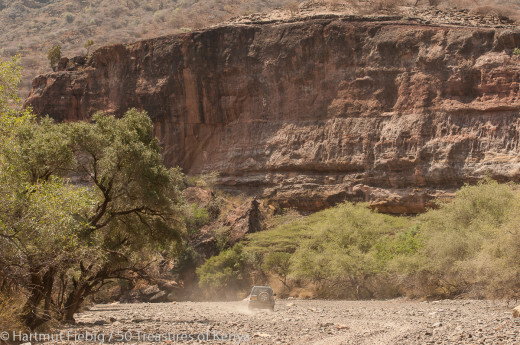 Dwarfed by massive rock faces and age-old trees, a car follows the track which leads through the labyrinth of Mlangoni Gorge. After roughly 20km, the gorge opens to the plains that roll out to the shores of Lake Turkana. To the north, spectacular cliffs of Lapurr Range promise you unforgettable vistas. 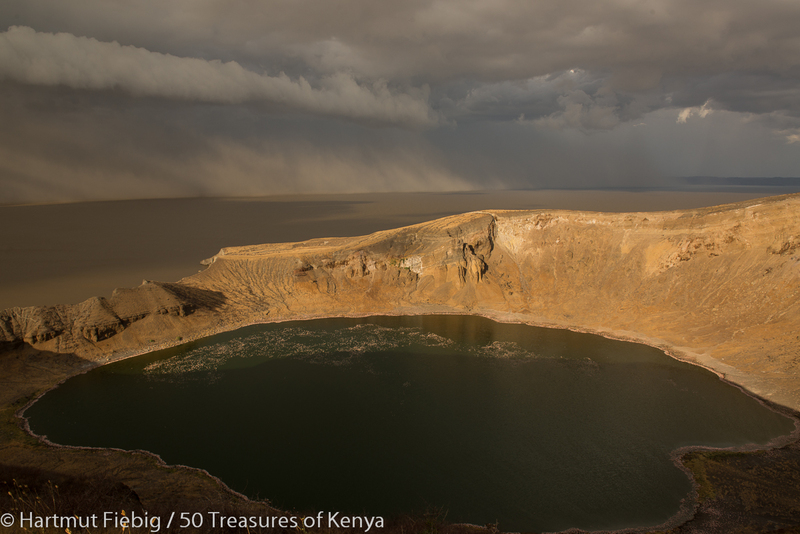 It probably is a two day adventure to conquer them and enjoy stunning views of Lake Turkana to the east. A young camel and its mother feed on the trees and bushes of Mlangoni Gorge. One of the most exciting findings of early man has been made in Nariokotome, a couple of kilometres inland from the shores of Lake Turkana right off the southeastern tip of Lapurr Range. The near complete skeletton of a 1.5 mio year old Homo erectus found right at the main road earned worldwide fame as ‘the Turkana boy’. It was detected on one of Dr. Richard Leakey’s research missions by Kamoya Kimeu. 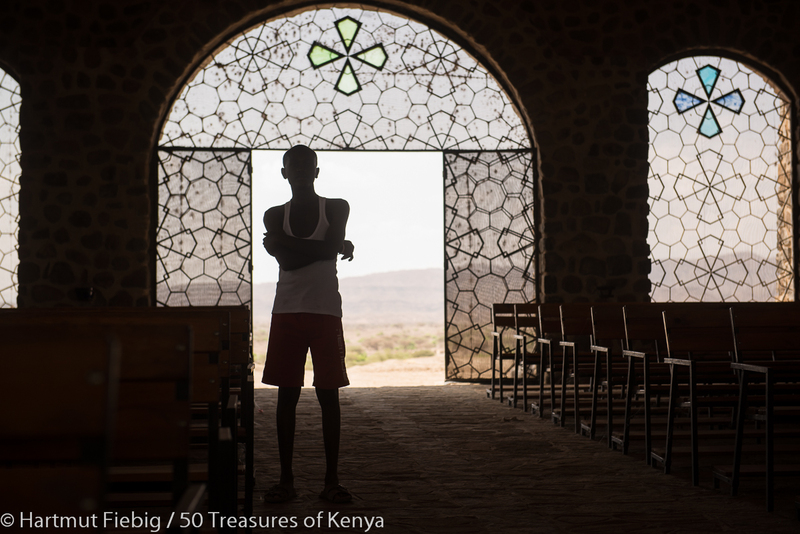 In October 2014 an on-site Turkana boy memorial is going to be put up since the invaluable originals of the bones are kept in a safe room at the National Museums in Nairobi. The site where the world famous Turkana boy was found will be marked by a memorial soon. But Nariokotome has to offer even more for its visitors. 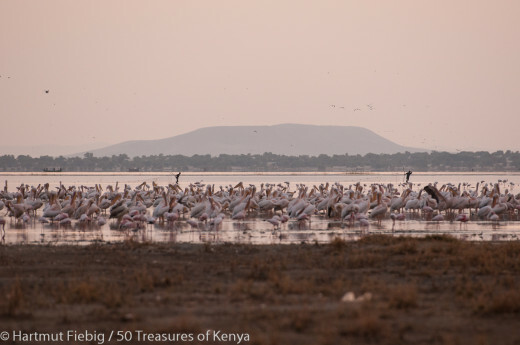 On the beach, there is a small lagoon where flamingos and other waterfowl feed. You have an exceptionally good view to Northern Island from here. The nearby village is probably the best starting point to visit the island. 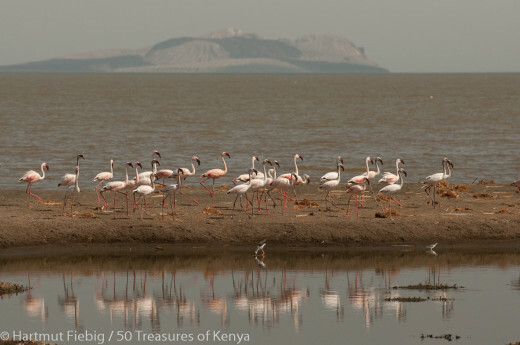 Flamingos feed at the small lagoon of Nariokotome which is dominated by the distinct features of Northern Island. On a small ridge towards the Lapurr Range lies the big compound of the Catholic mission station of Nariokotome often paraphrased as ‘Little Spain’. The missionaries are experimenting with growing dates, olives, wine and, yes even coconuts! You can divert from the main road to pay the beautiful church of the mission a visit. Behind the altar opens a window permitting to view the lake. 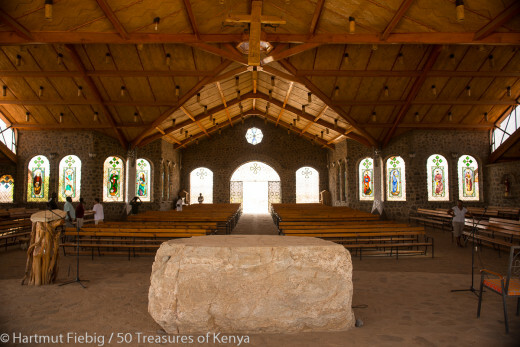 Inside the catholic church of Nariokotome; the beautiful building is airy and friendly and offers a view onto Lake Turkana. The church’s bell bears inscriptions in four languages: Turkana, Kiswahili, English and German. The mission owns an air strip and offers some clean guest rooms. A visit of Northern Island can be arranged with one of the local fishermen. A worshipper seeks refuge from the torching sun in the shady interior of Nariokotome Catholic church. 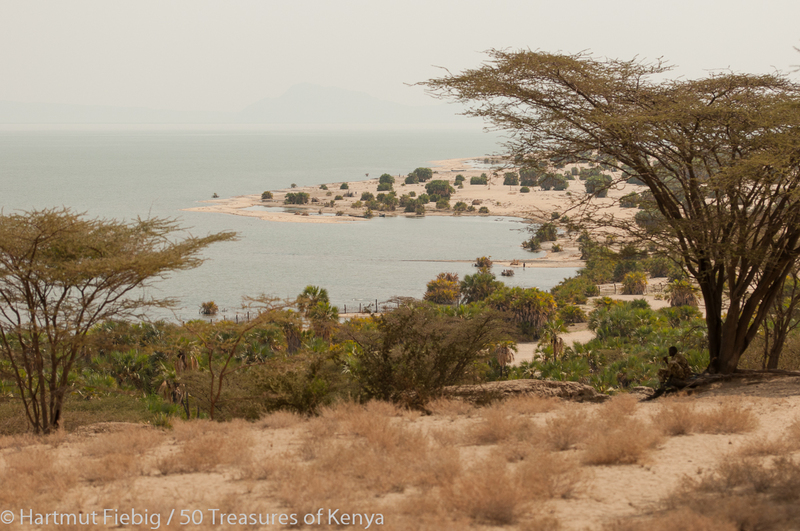 Driving towards Kalokol you follow the shoreline although views of Lake Turkana are rare. It is worth to branch of to the beach on some points to enjoy palm trees, sand dunes and the inviting water of the lake. You can easily access the beach at Kalimapus where a makeshift jetty has been erected for oil exploration ships. The palm fringed beach of Kalimapus invites you for a refreshing swim in the lake. Kalokol Town lies several kilometres off the lake which makes it a dusty but lively town. It has grown significantly in recent years thanks to a healthy fishing industry. The catch is processed and sold as far as Congo and Rwanda. 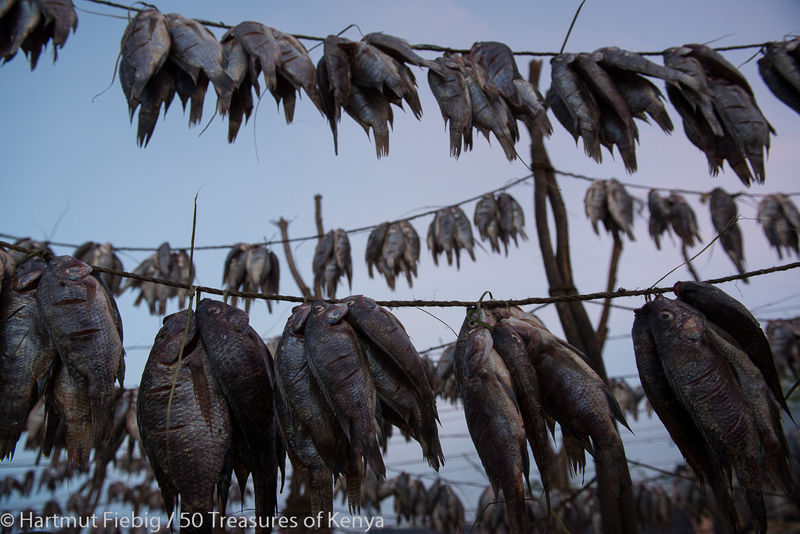 Tilapia from Lake Turkana is hanging on long lines to dry. Fish is sold freshly, dried or fried, offering plenty of jobs in the fishing industry. 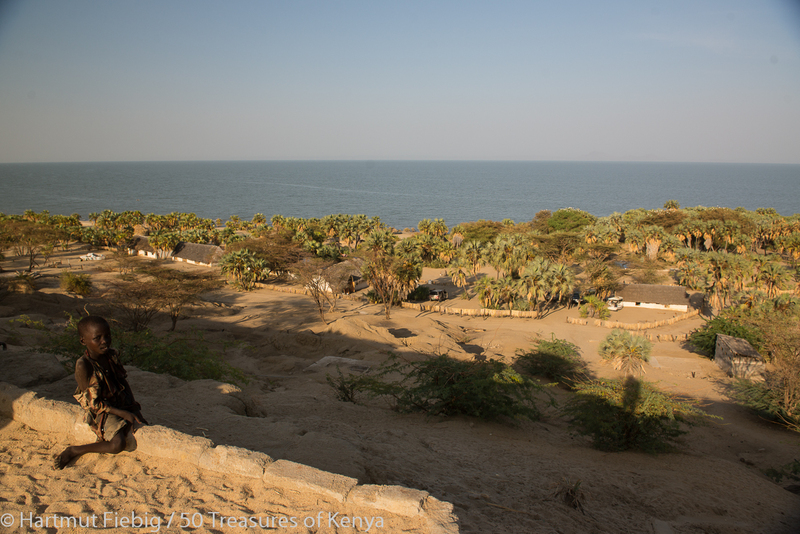 The fishing village of Kalokol beach appears to sit at the end of Africa as it looks over the vast waters of Lake Turkana. In case you plan to go to Central Island you will start your boat ride from here. 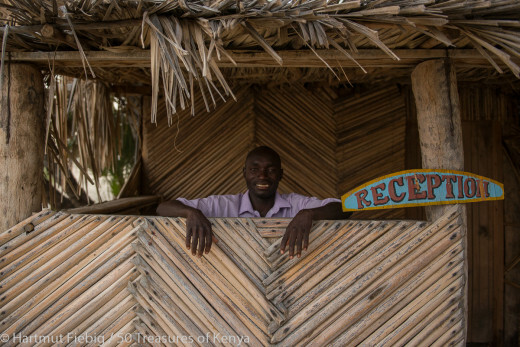 Kalokol beach is a scenic village with palm leave huts and fishing boats rocking on the waves. Kalokol offers comparably good infrastructure with simple, clean accommodation and a better equipped guesthouse just about to be opened. You can restock petrol, drinking water and other basic supplies. There are some decent local restaurants, too. There is a simple but clean and friendly guesthouse in Kalokol. 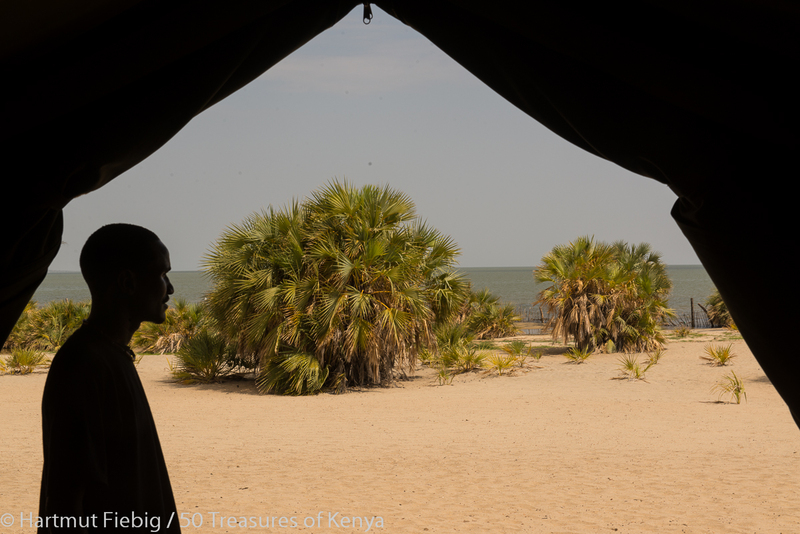 On Kalokol beach, Jade Sea Journeys runs a tented camp and there is a scenic simple campsite amongst the palm trees to the north of the village. 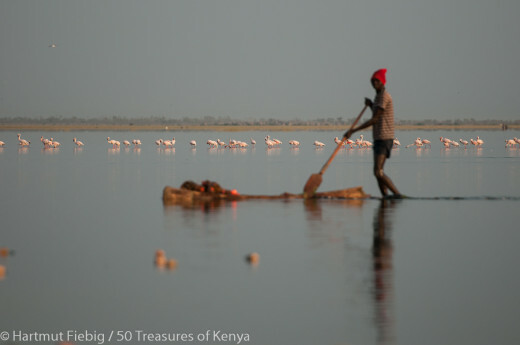 Fishermen and flamingos start their day at dawn on the shores of Kalokol beach. To the south of Kalokol, Ferguson Bay creates a vast landscape of mud flats and salt swamps with myriads of pelicans, flamingos and other birds. 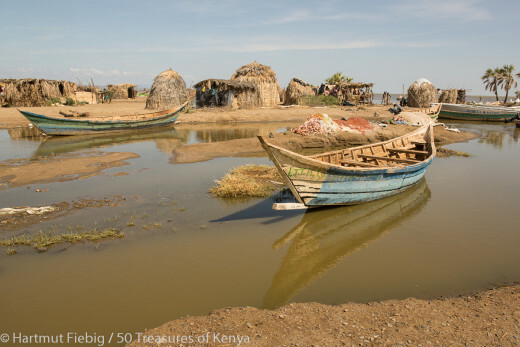 In between, fishermen land their catch with simple rafts and wooden boats. Pelicans congregate at Ferguson Gulf where fishermen pull their nets through the shallow waters. 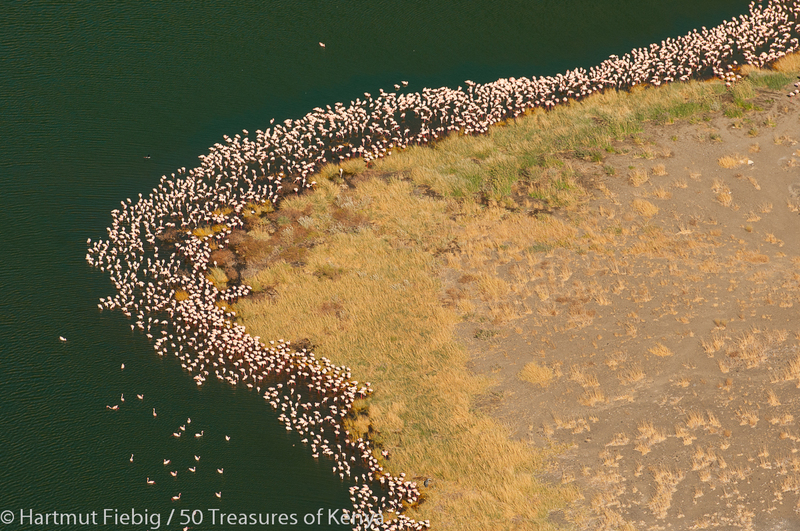 A fishermen drives his raft past a colony of flamingos feeding in the waters of Ferguson Gulf. 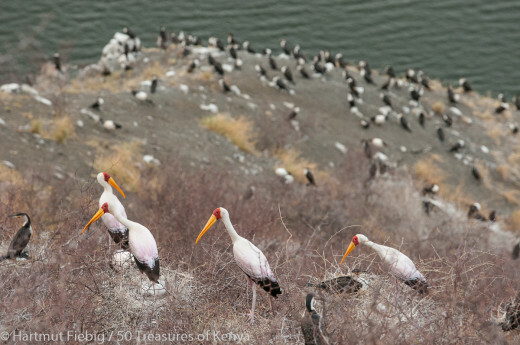 About 15km out in the lake lies Central Island which is protected as a national park for its unique volcanic landscape, huge colonies of nesting egrets, storks and cormorants as well as a crater lake which is home to tens of thousands of flamingos and other water birds. Depending on weather conditions, it is a 1,5 to 2 hours boat ride from Kalokol beach. Yellow bill storchs and cormorants breed on the steep slopes of Central Island’s volcanos. The island has three crater lakes, Turtle Lake, Tilapia Lake and Crocodile Lake. 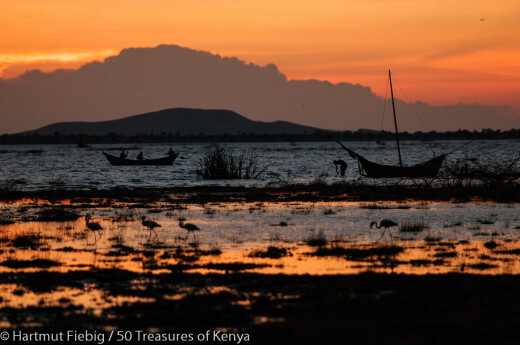 Walking trails lead you around the island and to the highest elevation from where you enjoy stunning views over two of the crater lakes and majestic Lake Turkana. The most stunning of all three crater lakes of Central Island National Park is home to tens of thousands of flamingos which can be seen as tiny white dots on the dark green water. Bring plenty of drinking water and own snacks as there is no other infrastructure or supplies apart from a simple shade protecting you from the boiling hot sun. The ground is sandy so you can camp near the KWS ranger post if you bring your own tents. Fire wood is provided. Boats from the KWS station or local fishermen can be hired at Kalokol beach and bring you over to the island. 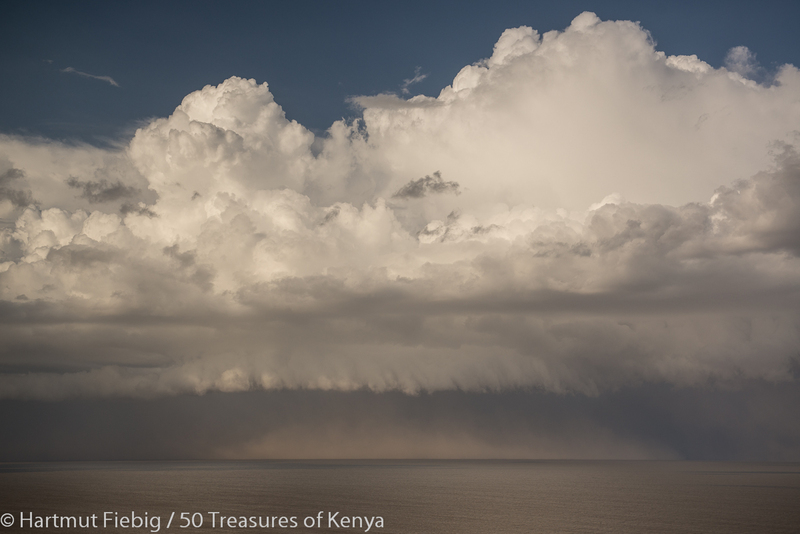 An awesome rainstorm is brewing over the waters of Lake Turkana, creating sky-high towers of clouds. Just 20km out of Kalokol, there is a remarkable archeological site by the left side of the road, where a dozen of blackish-red stone pillars grow from the ground. Scientists believe the site is around 2000 years old. 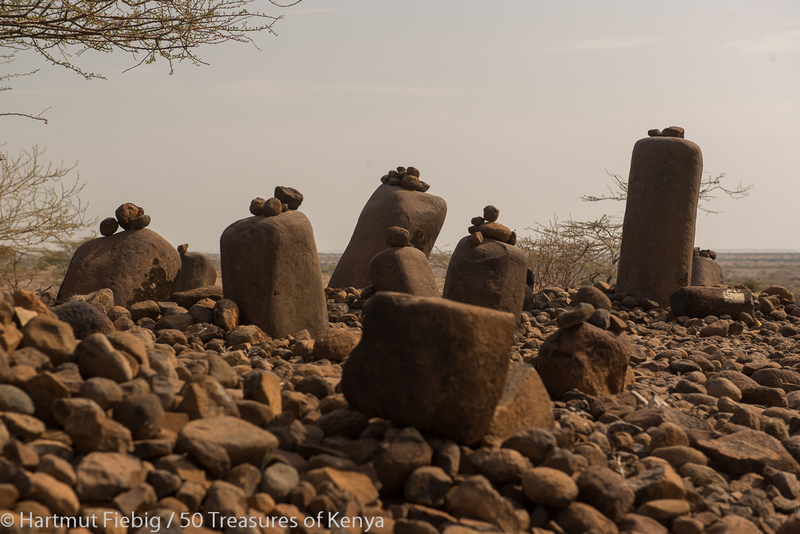 To the Turkana people Namorutunga is a sacred place until today – notice the many pebbles that have been placed on or near the pillars. Please respect the sacred place, don’t touch or damage the stones and take your litter along. The ancient standing stones of Namorutunga off the main road between Lodwar and Kalokol remain a sacred place for the Turkana people up to today. Along the coast south of Kalokol stretches an endless chain of sand dunes overgrown by doum palms. 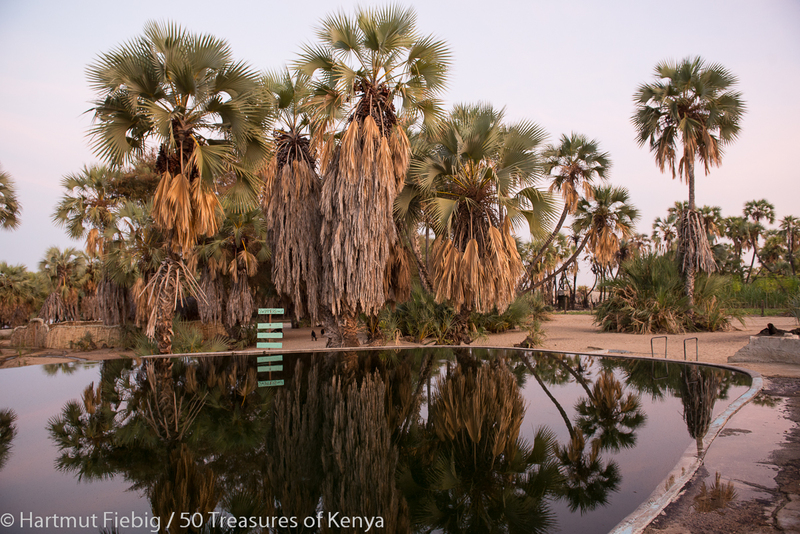 After about 25km you reach Lobolo swamps where a crystal clear spring creates a huge palm groove right at the sandy coastline. There is a marvelously set camp run by Jade Sea Journeys next to the spring at the food of the dunes. The dunes and the natural coastline with a peninsula and a big lagoon are waiting to be explored by foot. It is here you find absolute serenity in a very special location. Lobolo swamps camp is and exclusive camp run by Jade Sea Journeys which brings some comfort to a magic but also very remote place on the shores of Lake Turkana. Eliye Springs, another 25km to the south is much better known and boasts a somewhat turbulent history. 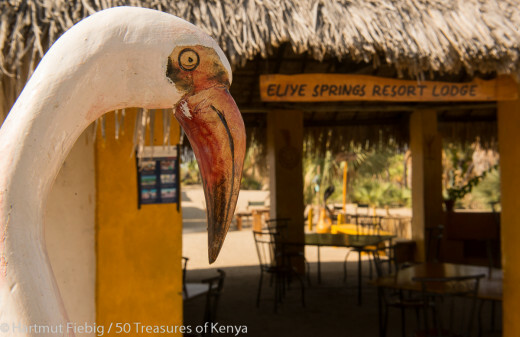 During the 1970s and 1980s Eliye Springs Lodge was a hangout for anglers and the international jet set who flew in from Nairobi, until the decline of the place set in. 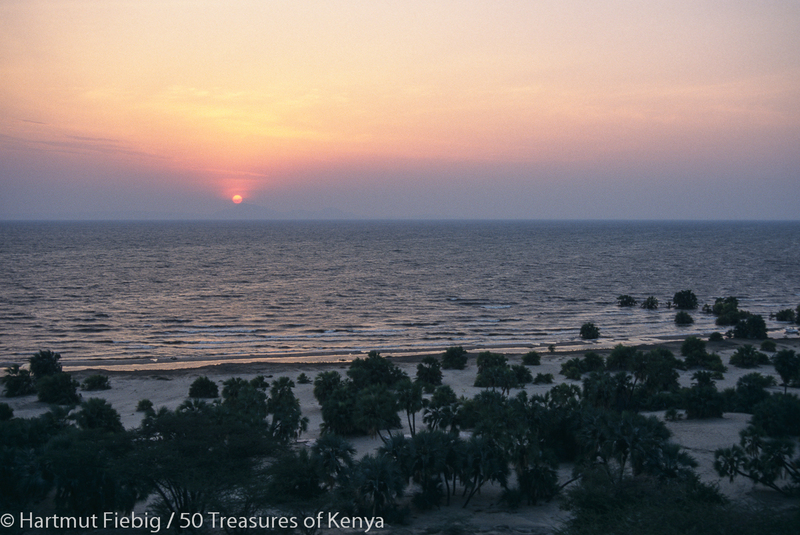 Lake Turkana and the early morning sun seen from the dunes of Eliye Springs. The local staff would desperately cling to operating at least a basic facility for years until the right persons finally came to re-build the place. 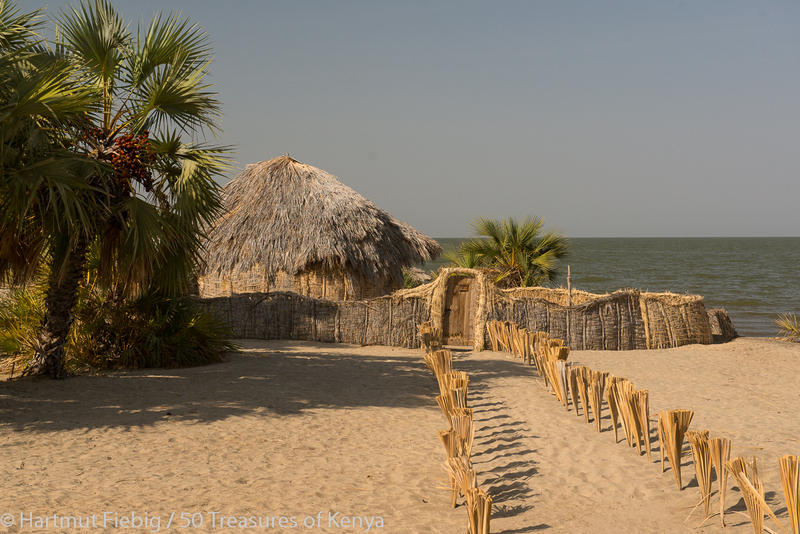 Eliye Springs Lodge is placed in a palm groove right by the shores of Lake Turkana. Accommodation: Today, Eliye Springs Lodge on the foot of steep sand dunes has turned into a paradise again for those who want to relax by the lakeside. There are stylish huts built with palm leaves and lavish bathrooms right at the shores and other, simpler options for accommodation. The huts are built with traditional materials; the rooms are astonishingly cool. The Lodge also offers camping facilities, a good restaurant, a bar, a swimming pool with spring water for those who don’t want to swim in the lake, and various water sporting activities and excursions. The swimming pool of Eliye Springs Lodge is fed by a nearby mineral spring which lent the place its name. The name giving springs lies on the compound and sends small streams between the huts down to the lake. Eliye Springs Lodge has a cosy bar and a restaurant with tasty fresh food. Two other tourist facilities have come up recently which offer basic lodging and/or camping, food and a bar – and another beautiful stretch of Eliye Springs’ amazing sandy beach! You will find different types of accommodation in Eliye Springs – from simple but charming to luxurious.